CHANG Medium® C, CHANG Medium® D and CHANG Medium® In Situ are optimized for culturing human amniotic fluid cells and chorionic villi sampling (CVS) during prenatal care. CHANG Marrow® and CHANG Medium® MF were developed for culturing bone marrow and peripheral blood during postnatal care. Chang Medium® C is intended for the primary culture of human amniotic fluid cells for use in karyotyping and other prenatal genetic diagnostics. This formula is suitable for both open and closed systems and consist of a two part kit system: a liquid basal medium and a supplement. CHANG Medium® C is CE-marked for in vitro diagnostic use. Chang Medium® D was developed for the primary culture of human amniotic fluid cells for use in karyotyping and other prenatal genetic testing. This formula has been optimized for both flask and in situ methodologies. Packaged in single bottles, ready-to-use with no mixing required. CHANG Medium® D is CE-marked for in vitro diagnostic use. Chang Medium® In Situ is intended for the primary culture of human amniotic fluid cells for use in karyotyping and other prenatal genetic testing. This formula has been optimized for in situ methodologies. Packaged in single bottles, ready-to-use with no mixing required. CHANG Medium® In Situ is CE-marked for in vitro diagnostic use. CHANG Marrow® is a complete, ready-to-use medium intended to support bone marrow cultures for karyotyping and other genetic testing of various hematological disorders. 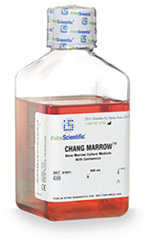 After an extensive optimization process to create a superior, innovative blend of growth factors, FUJIFILM Irvine Scientific’s CHANG Marrow® has been shown to out-perform other commercially available media in clinical	studies. Packaged in single bottles, ready-to-use with no mixing required. CE-marked for in vitro diagnostic use. 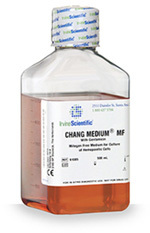 CHANG Medium® MF is intended for the use in culturing human peripheral blood cells, bone, marrow, T-cell lymphocytes, and other human specimens for purposes of cytogenetic analysis. CE-marked for in vitro diagnostic use. This medium is derived from a human tumor cell line. It provides an effective combination of cytokines and growth factors like GM-CSF, G-CSF, IL-1 and IL-6 for a wide range of applications. For research use only. The above list is representative of products we have on stock. We welcome the opportunity to provide you with custom formulations. Please ask for a quote.